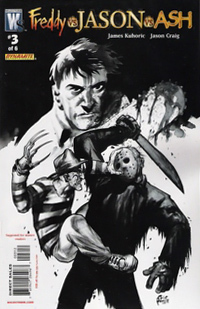 WildStorm, an offshoot of publisher DC Comics, picked up New Line Cinema’s “House of Horror” license in October 2006. 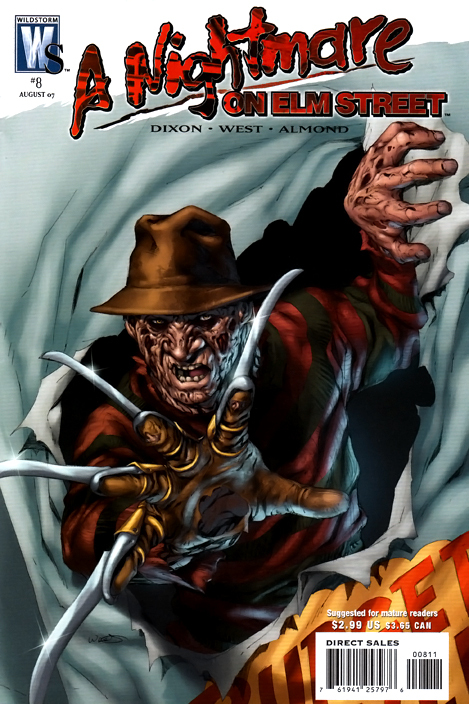 WildStorm published an eight issue series for A Nightmare on Elm Street and followed with a one-shot, New Line Cinema’s Tales of Horror. Popular comics writer Chuck Dixon wrote the main series with art by Kevin West, Tony Harris, Jim Clark, Joel Gomez, Don Ho, and Ben Oliver. 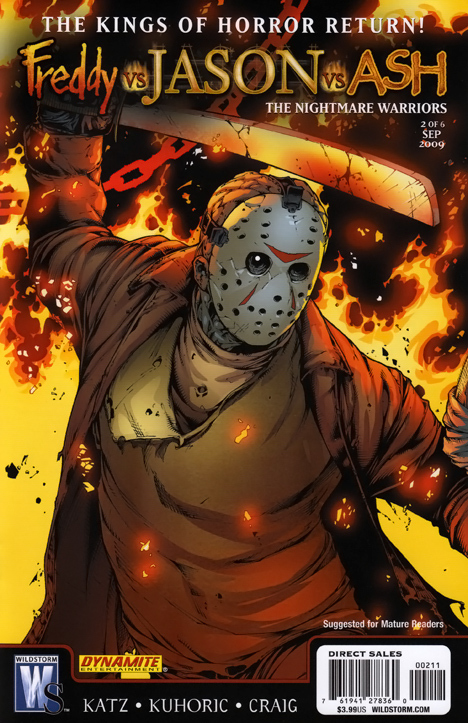 In 2007, WildStorm teamed with Dynamite Entertainment to publish a direct sequel to the hit film Freddy vs. Jason: Freddy vs. Jason vs. Ash. 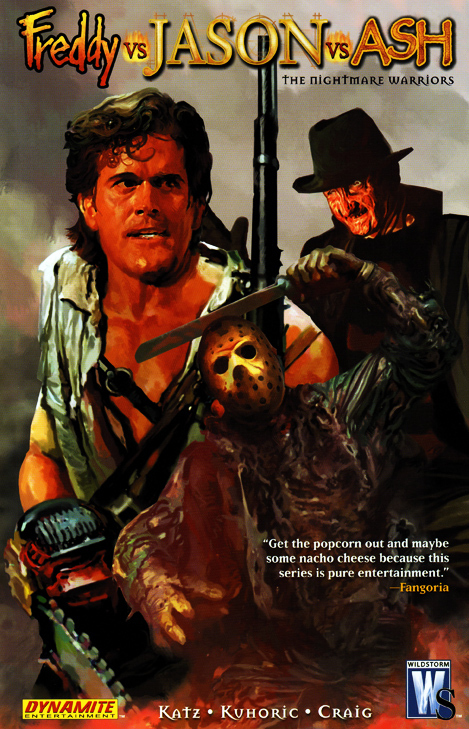 The sequel’s premise teamed villains Freddy Krueger and Jason Voorhees against Evil Dead/Army of Darkness hero Ash Williams and was based on the film treatment by Jeff Katz. 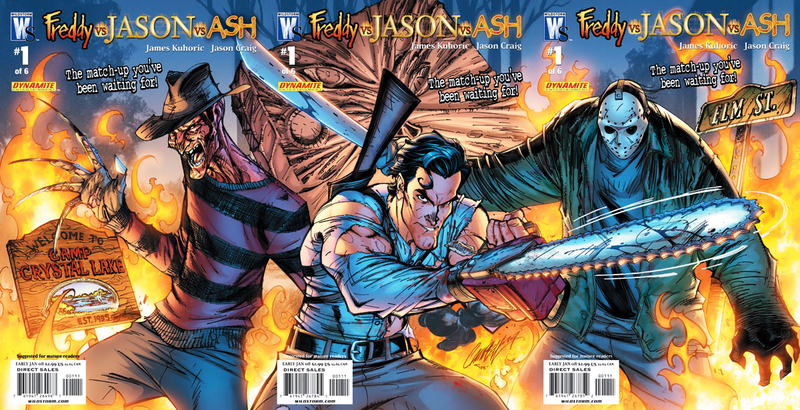 WildStorm released Freddy vs. Jason vs. Ash as a six-issue mini-series. 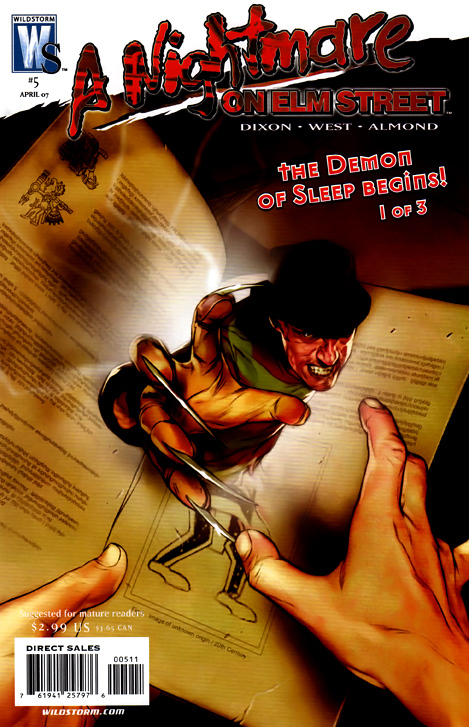 It was written by James Kuhoric with art by Jason Craig and J. Scott Campbell. 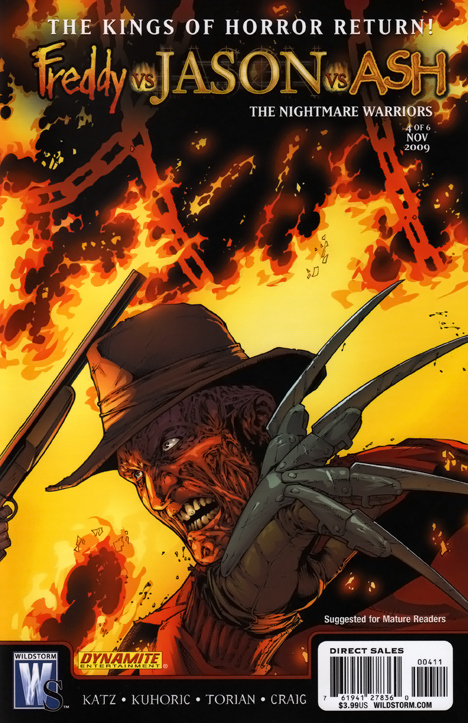 The creative team followed with another sequel in 2009 titled Freddy vs. Jason vs. Ash: The Nightmare Warriors. 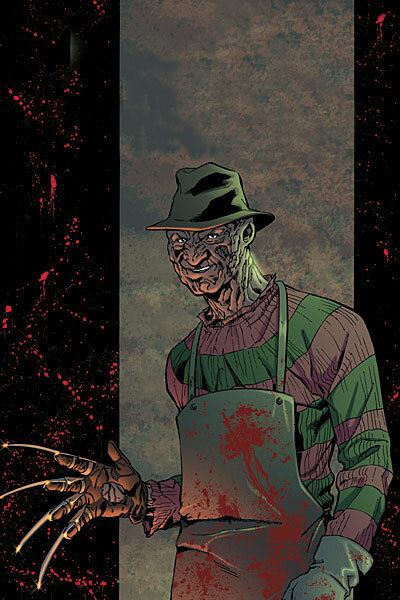 From the twisted mind of Chuck Dixon (Nightwing, Claw) comes a fresh look at one of the most frightening horror icons of all time: Freddy Krueger! A new family has moved to the quiet town of Springwood and when night falls, the town quickly learn its horrible secret! 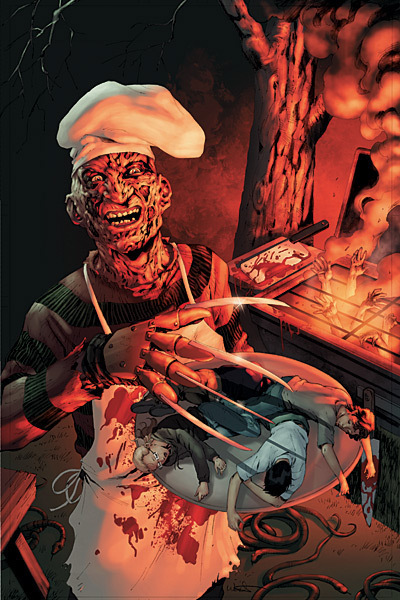 Will this new family survive a new nightmare on Elm Street? Or can the tables be turned in the monstrous dream realm? 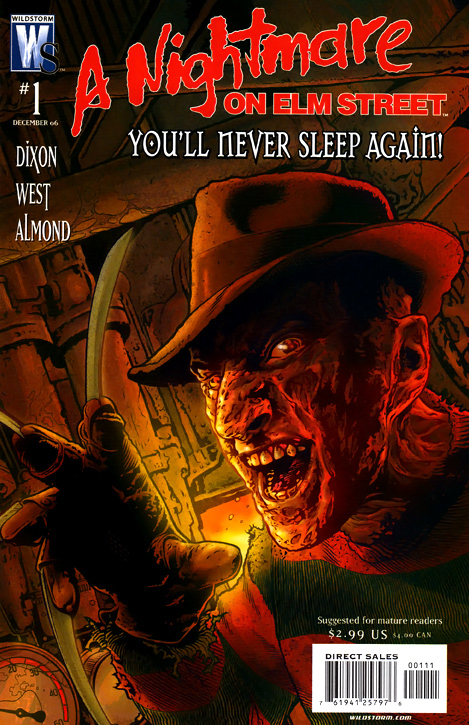 Freddy Krueger has returned to haunt Springwood in this terrifying new series! 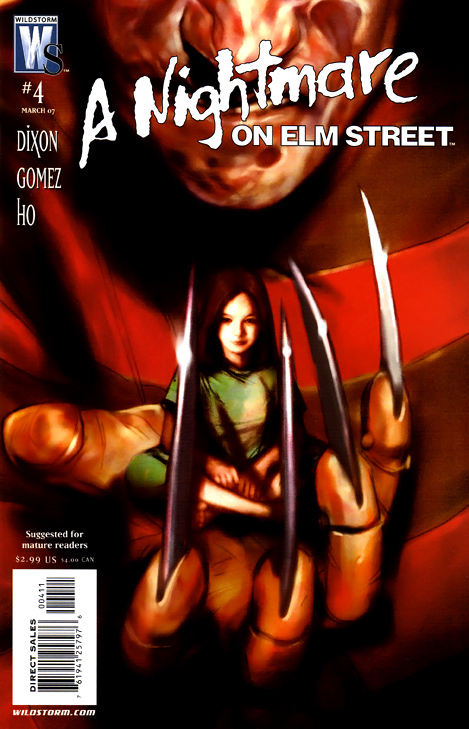 As the monster stalks the dreams of the new family, a mysterious little girl keeps appearing in the dreams and foiling Freddy’s murderous fun. What secret does she hold? And does a former Army Ranger, trained in sleep deprivation and Zen techniques, stand a chance against the this evil master of dreams? 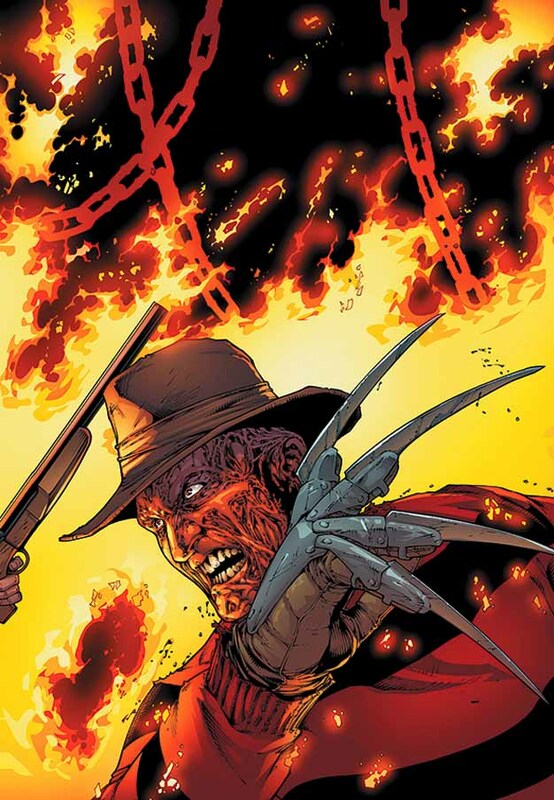 Horror icon Freddy Krueger is murdering teenagers again—and one father has had enough! 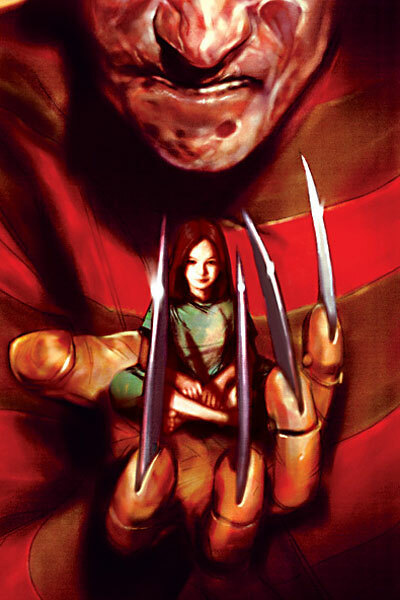 Taking the battle directly to Freddy in the dream realm, one man is willing to risk everything to protect his child. But will it be enough? 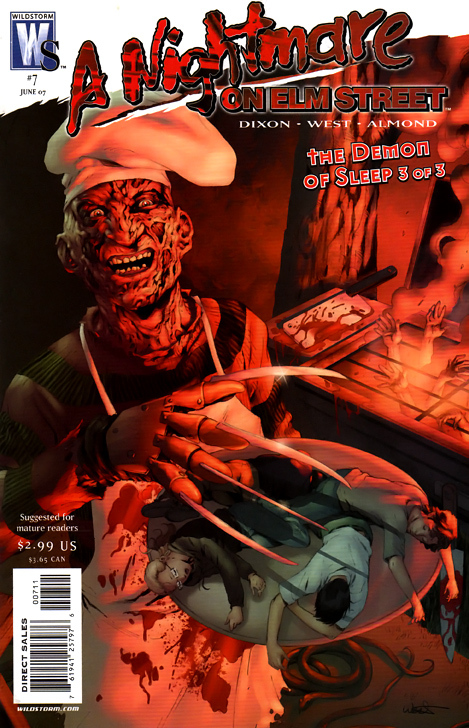 A unique issue exploring the dream world of Freddy Krueger! Does the Dream Master himself dream? Haunted by “the one that got away,” Freddy gets a taste of the medicine he’s dealt out for years… and it won’t be pretty! 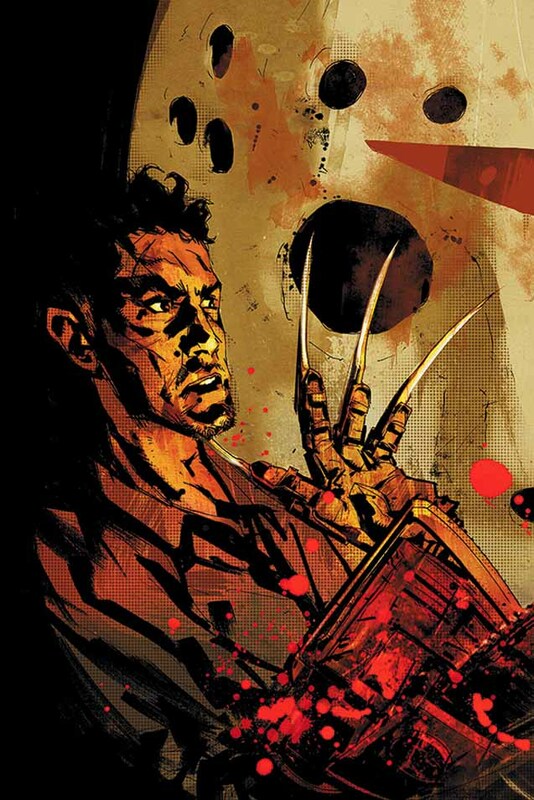 Plus, Ben Oliver (Ultimate X-Men) debuts as the series’ new cover artist! A new story arc begins! A group of teens stumble upon a manuscript chronicling secrets of the ancient Aztecs—and a particular legend surrounding a sleep demon! 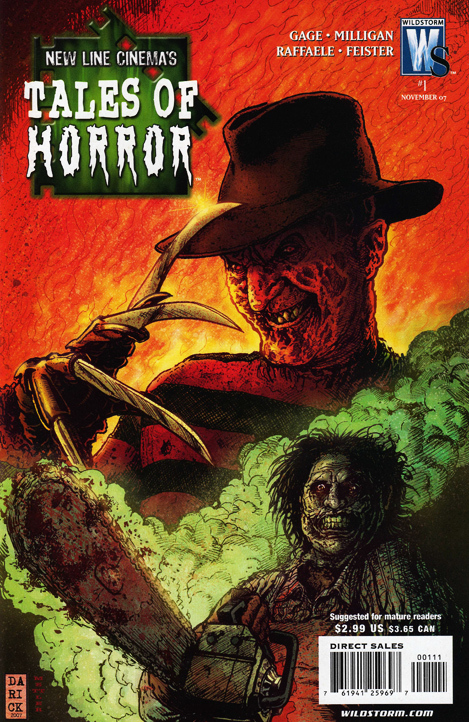 A monster that could be summoned to ward off dark spirits and tormentors—could Freddy have finally met his match? 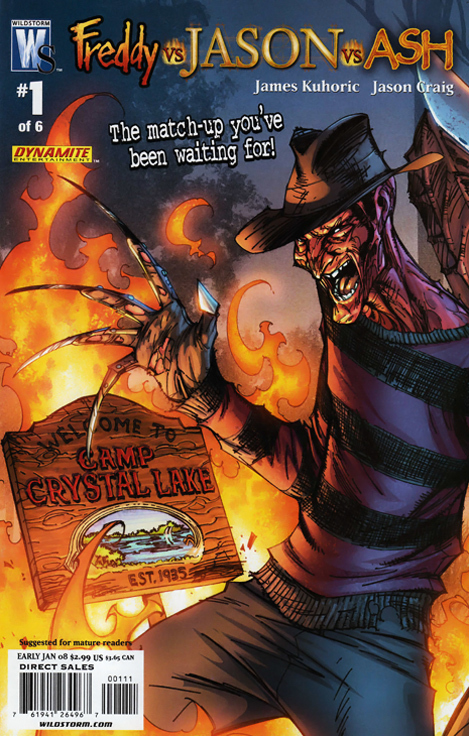 Freddy is targeting the kids in possession of the Aztec manuscript, so they put their plan into motion. Will they be able to implement the necessary rituals in time? They’ll learn one terrible secret—to summon the sleep demon, a human sacrifice is needed! 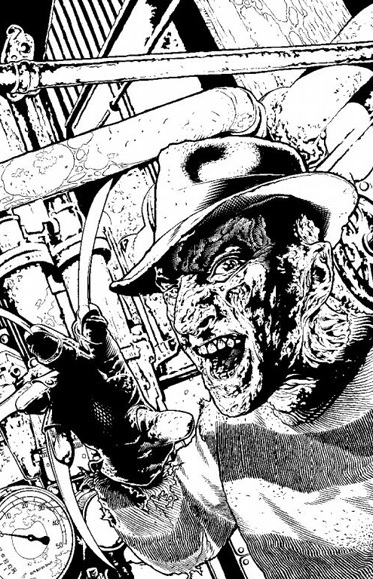 It’s a free-for-all between Freddy Krueger and a thousand-year-old demon from a forgotten people in a big box store turned Aztec temple. But what do the surviving teens really have to fear? The dueling monsters—or each other? 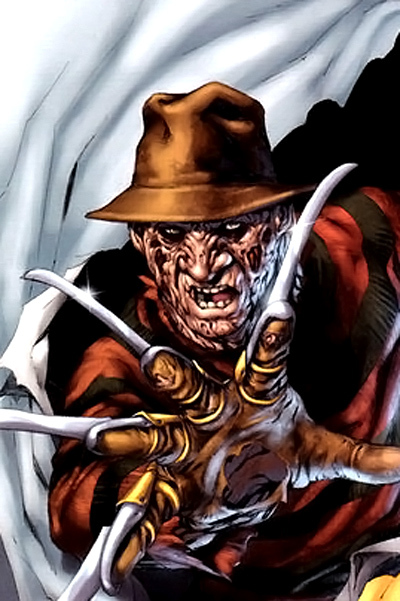 What could be more terrifying than Freddy Krueger’s twisted nightmare world? Working a double shift at a fast food restaurant! But when the lines between the two cross, a recipe for horror is created. 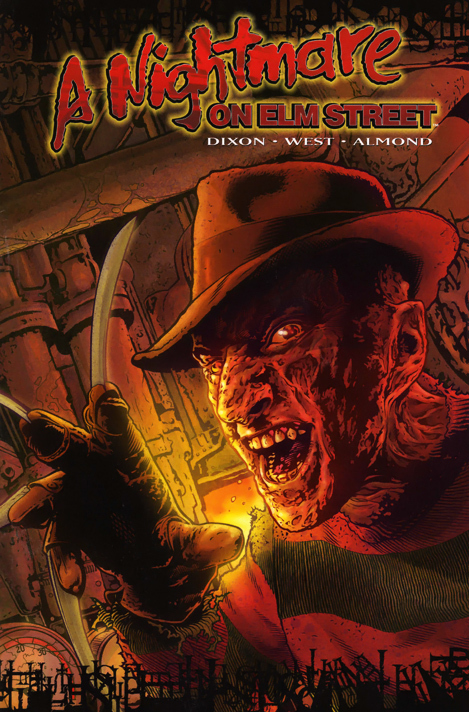 Collecting issues #1–3 and #5–7 of the red-hot new series that takes a fresh look at one of the most frightening horror icons of all time: Freddy Krueger! A new family has moved to the quiet town of Springwood and when night falls, the family quickly learns the town’s horrible secret. 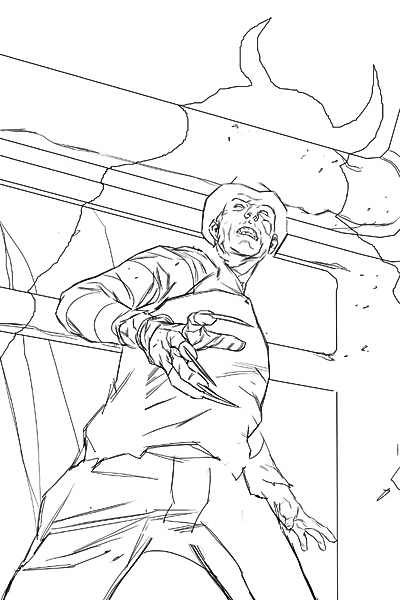 Trade Paperback also contains Nightmare sketch gallery. 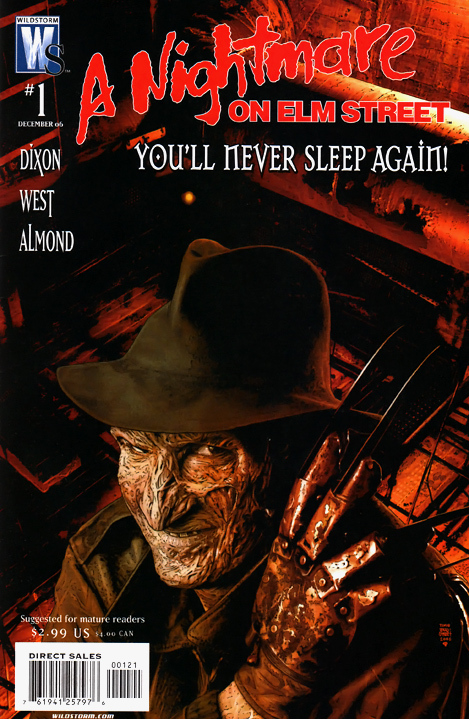 In September 2007, the main Nightmare on Elm Street series was cancelled with issue #8. Afterward, WildStorm began a showcase series titled “Tales of Horror,” which featured a new short story for A Nightmare on Elm Street and The Texas Chainsaw Massacre. 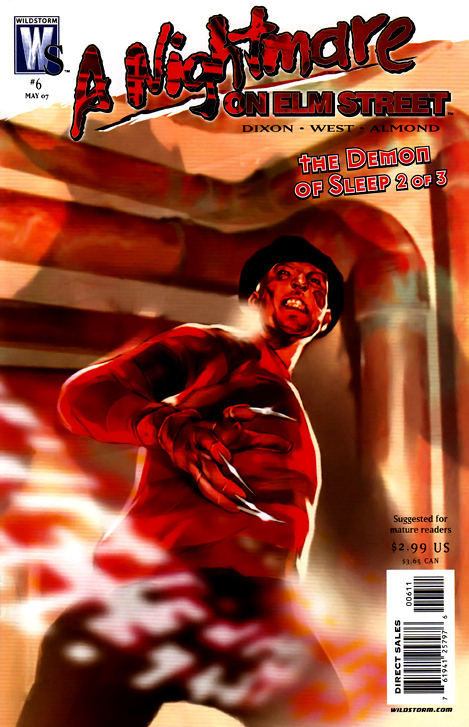 Only one issue of this series was released before WildStorm folded. Freddy vs. Jason vs. Ash was based on Jeff Katz’s film treatment which can be read here. 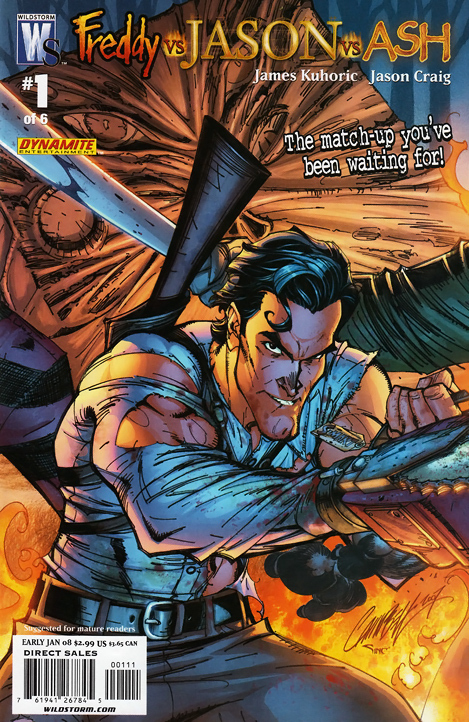 The creative team for this series also participated in group commentaries for popular comic industry news website Newsarama. Read the archived commentaries here. Also available is the sample artwork Mental Studios submitted as part of their portfolio. Click here to view it. 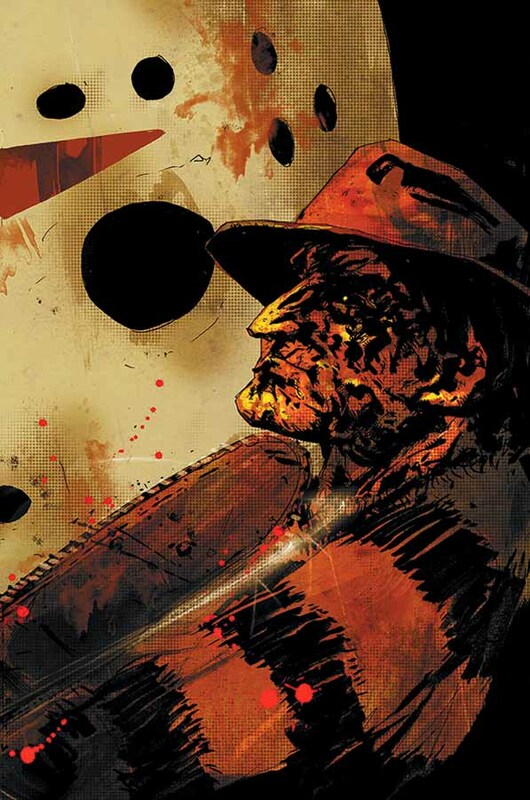 In the bloody wake of the hit movie Freddy vs. Jason, Freddy Krueger finds himself clinging to the last shred of fear that allows him to exist… inside the demented mind of Jason Voorhees. Unwillingly bonded together, the murderous pair must seek out the Necronomicon, the only solution to their mutual torment. 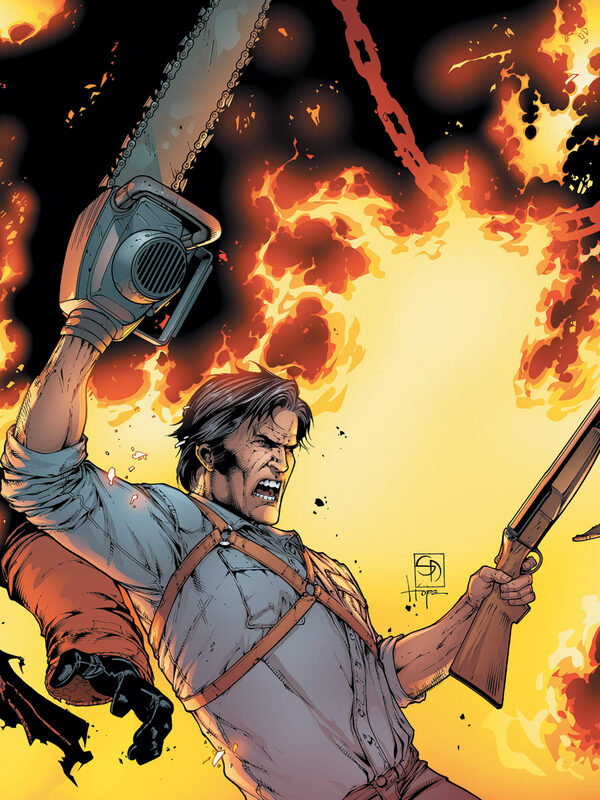 Nothing can stop this unholy alliance—except the wisecracking, chainsaw-wielding Ash, aimed at destroying the Book of the Dead once and for all! 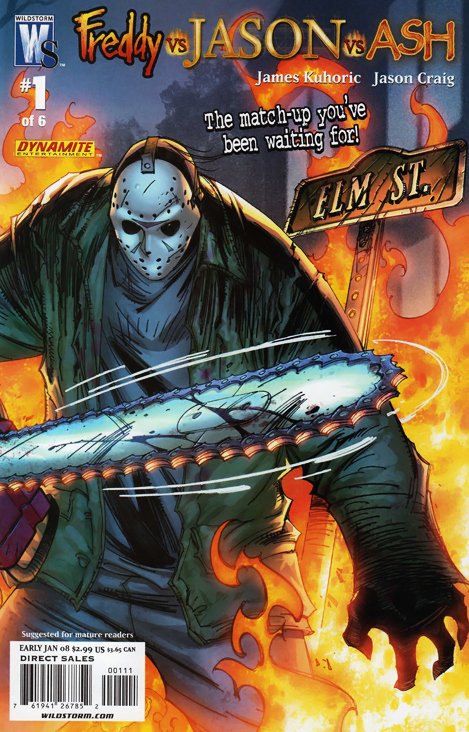 Heads will fly as Jason and Freddy lay siege to Crystal Lake’s newest S-Mart, where Ash and the rest of the gang guard the Necronomicon with their very lives. Will Freddy free himself from his hellish prison, or will Ash finally fulfill his destiny? 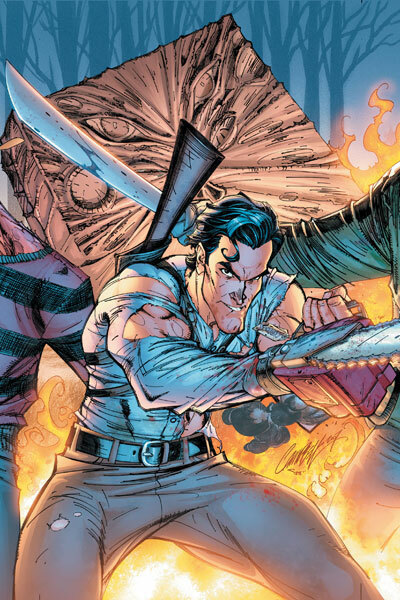 It’s a machete-swinging, boomstick-firing brawl as only Wildstorm and Dynamite can deliver! The madness continues! 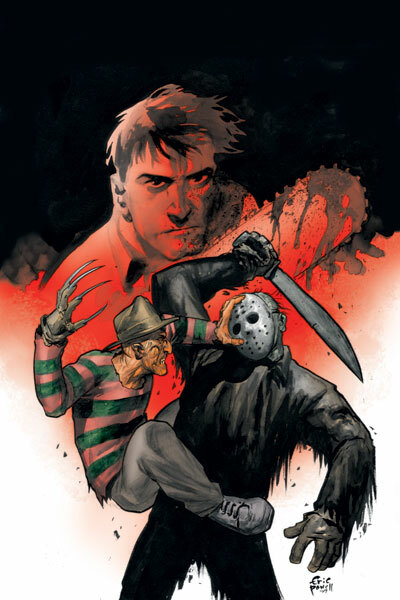 Freddy manipulates Jason into battling Ash for the Necronomicon… and if Jason gets it, Freddy will once more be free to wreak havoc! Co-published with Dynamite Entertainment. 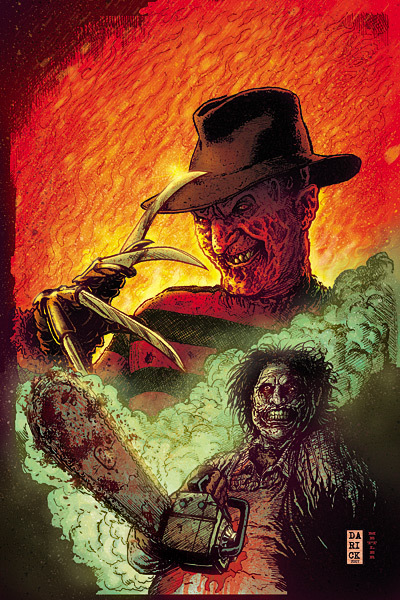 The ultimate bloodbath continues as Ash must face Freddy for the first time in the nightmare realm! Can even the Chosen One stop the Springwood Slasher now that he has the Necronomicon and has the power to warp reality outside the dream world? 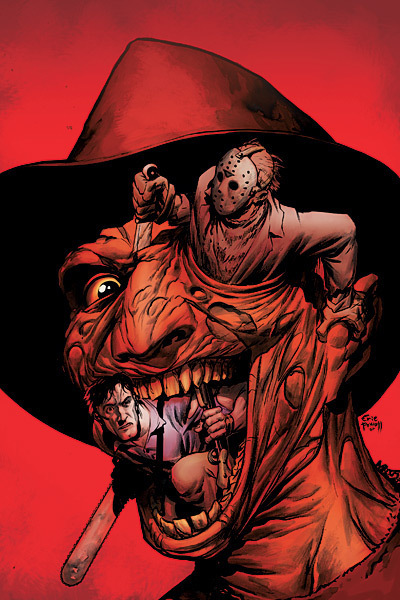 The Freddy vs. Jason vs. Ash comics event rockets you along a rollercoaster ride of over-the-top horror and classic movie-monster murder! Hail to the horror kings, baby! Co-published with Dynamite Entertainment. 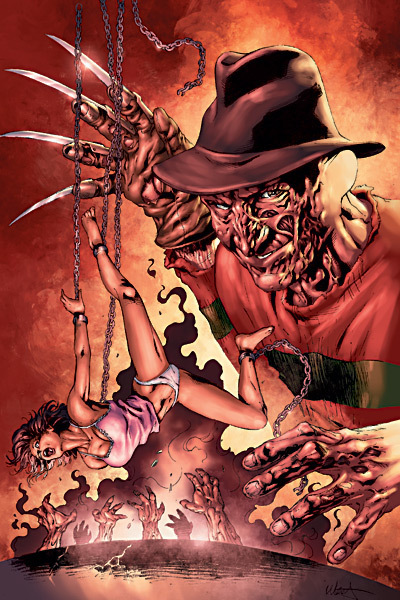 The Necronomicon’s demonic passages freed Freddy from the black hole of Jason’s subconscious and granted him the power to manipulate reality just like the dreamscape. 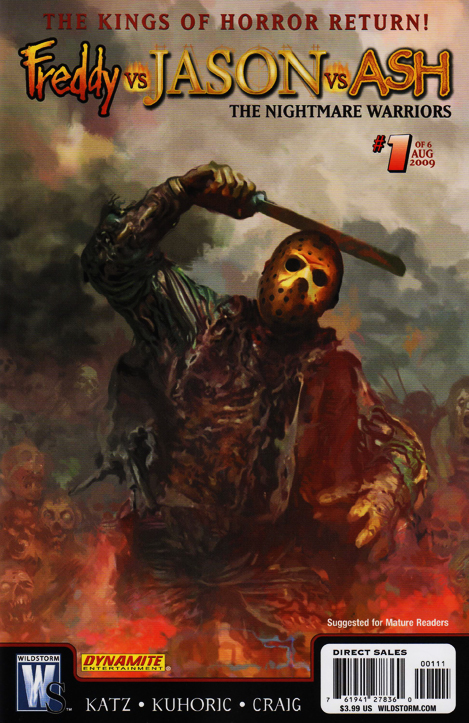 Jason is being dragged down by hundreds of zombies—victims—from his reign of slaughter. And Ash is stuck in the middle trying desperately to get the book, say the words, and send the two monsters back to hell. 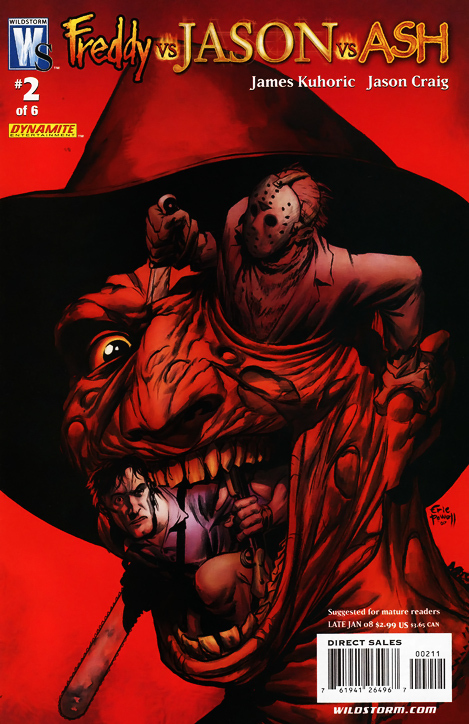 Freddy, Jason, and Ash face off for possession of the Necronomicon and a chance to either save the world or send it straight to hell! It all ends here—and only one of the three will walk away from the movie monster fight of the century! Co-published with Dynamite Entertainment. 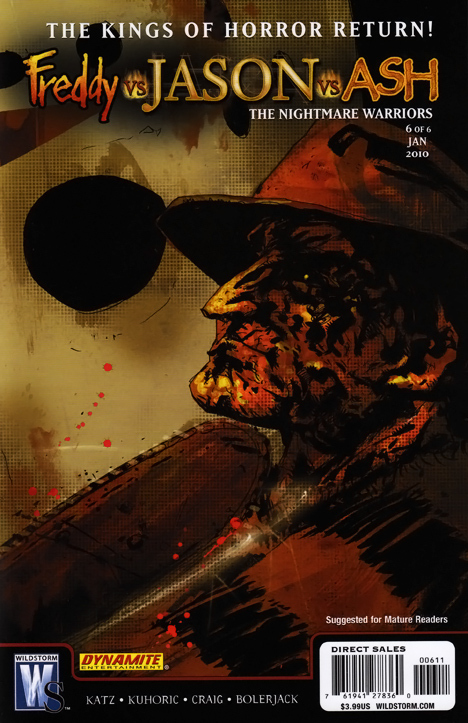 Collects the full series: issues #1–6. 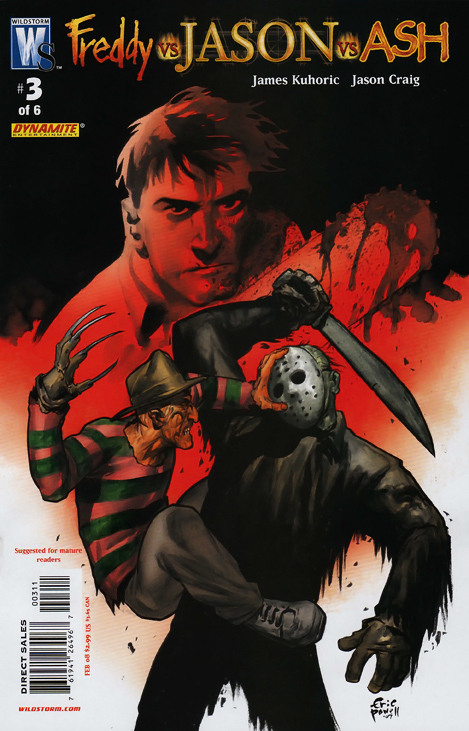 Freddy, Jason, and Ash face off for possession of the Necronomicon and a chance to either save the world or send it straight to hell! Co-published with Dynamite Entertainment. 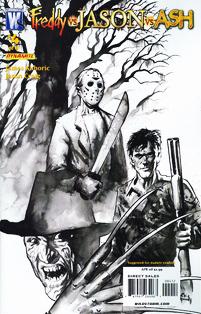 Trade Paperback contains an alternate illustrated ending, small sketch gallery, and creators’ commentary. 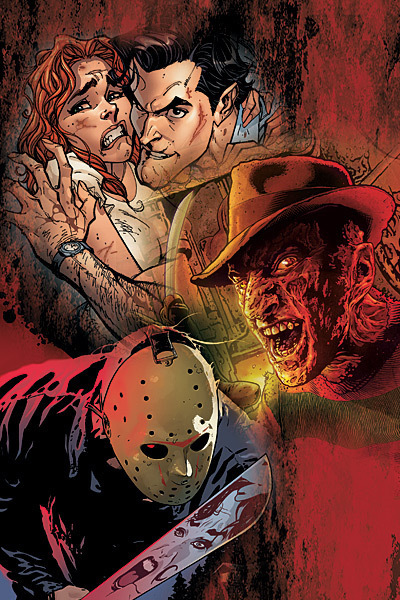 Beneath the bloody waters of Crystal Lake, an immortal evil wakes and begins anew the cycle of grueling violence. 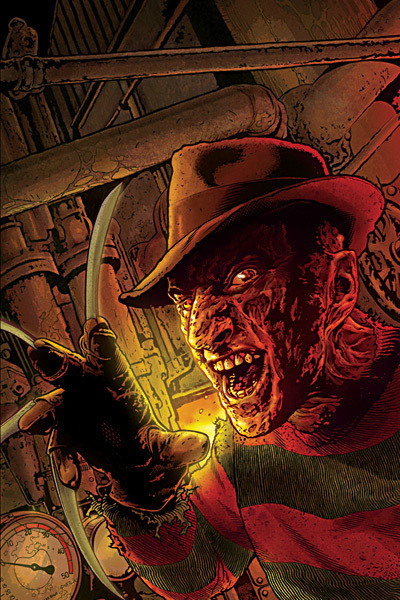 Six months after the events of Freddy vs. Jason vs. Ash, a power-hungry government bureaucrat unleashes the denizens of the Necronomicon including the banished spirit of the Springwood Slasher, Freddy Krueger. 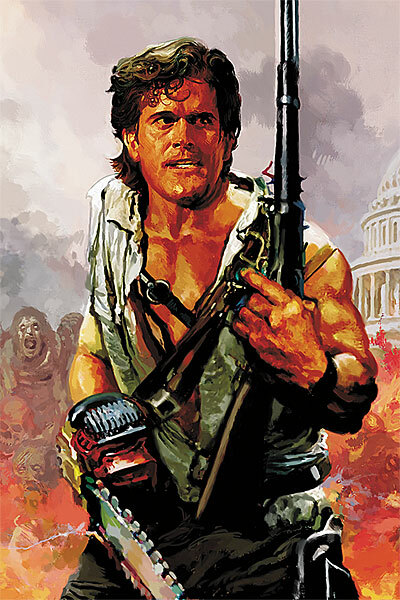 But Ash Williams has checked his monster-hunting past at the door. A Chosen One no more, he thinks that a life of domestic bliss and retail tending is his true calling until the ghosts of the past show up to punch his clock again. Something strange is happening in the halls of Project Black Book. The covert government group is unleashing creatures of mass destruction in their bid to gain control over the Necronomicon. And as the survivors of Freddy and Jason’s murder sprees congregate, the short-lived reunion is shattered by the violent arrival of Jason Voorhees. 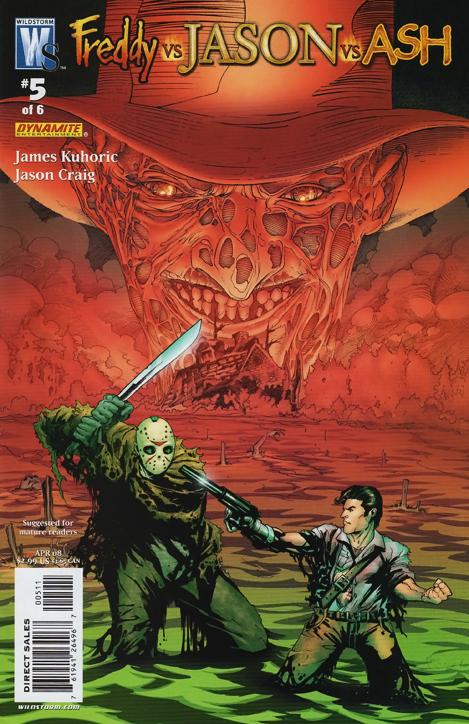 But when a mysterious stranger arrives to aid in the battle, Jason must confront the one man who has not only survived his murderous rampages but has also “killed him” in the past. 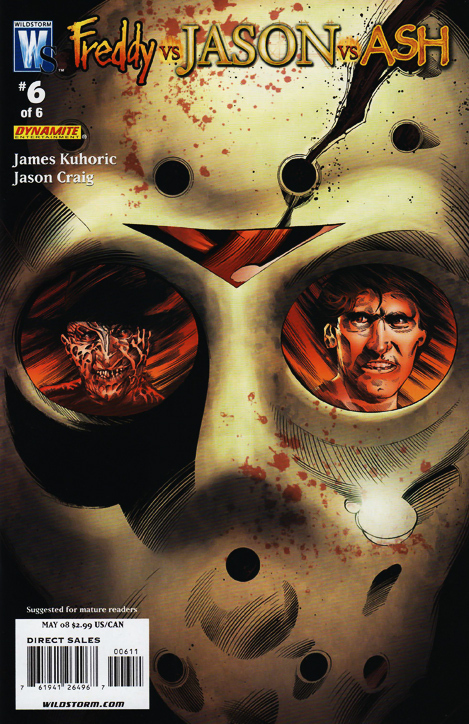 Fan favorite Tommy Jarvis returns to finish what he started and see Jason Voorhees buried a final time! 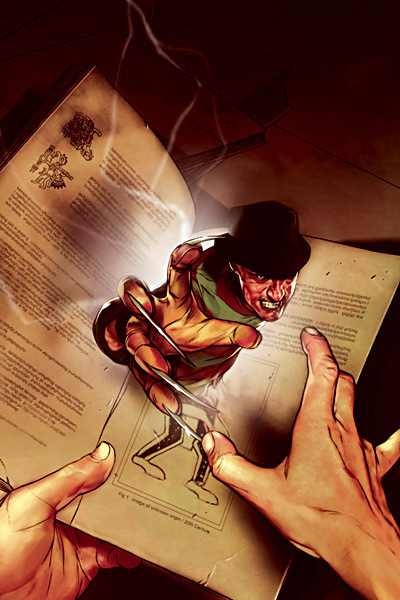 Freddy Krueger has become one with the Necronomicon, and he has the full power of the book at his disposal—including control of the Deadites. 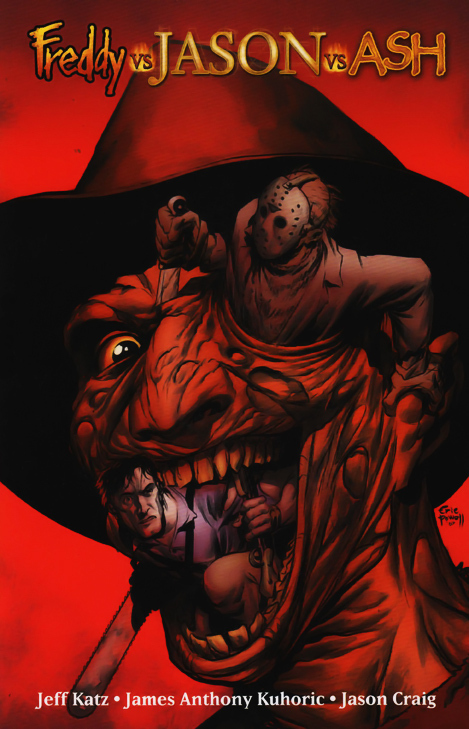 Making a Faustian bargain with Jason Voorhees, Freddy promises to return everything he’s lost if Jason will be a general in Freddy’s army. Will Washington D.C. fall to such nefarious foes? Who could possibly stand against such forces? 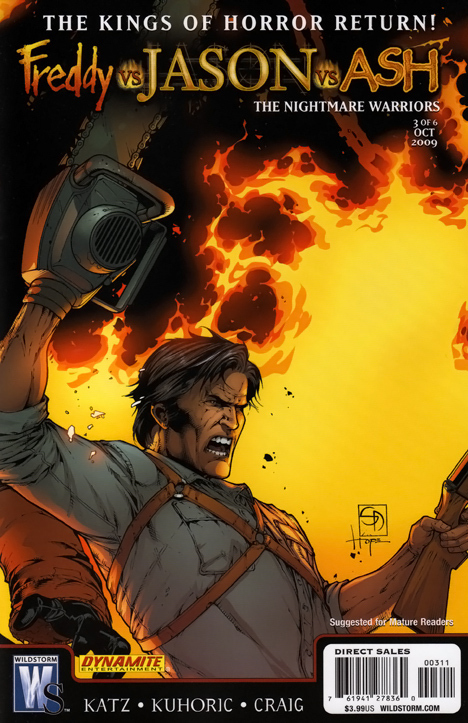 Ash Williams and Tommy Jarvis aim to find out. Zombies, Deadites, and demons oh my! 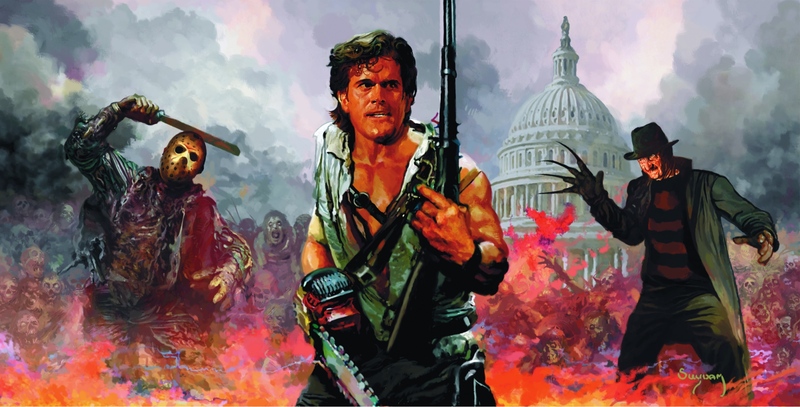 The army of the dead is loose in Washington, D.C. and no one is safe from their rampage. 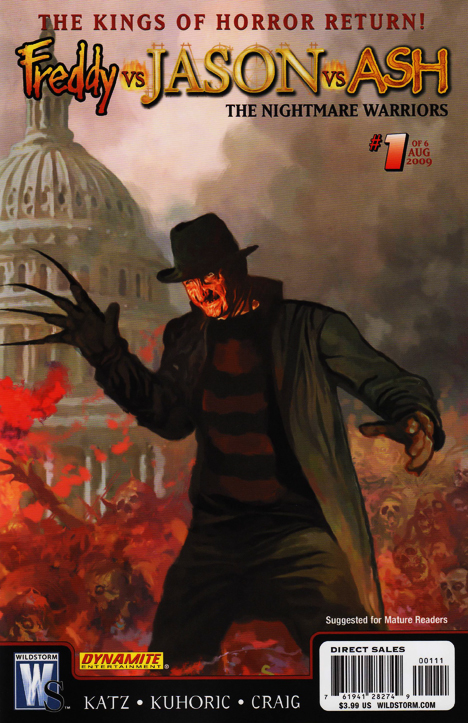 As the capital city burns, Freddy Krueger’s devious plan starts to come together. No longer is he limited to the kids from Springwood or Crystal Lake. 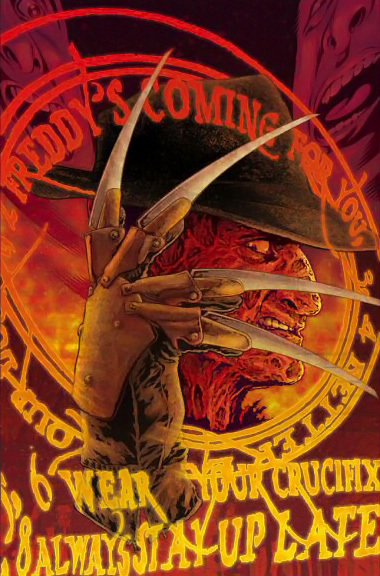 Now the world is his Elm Street, and the streets will flow with blood. 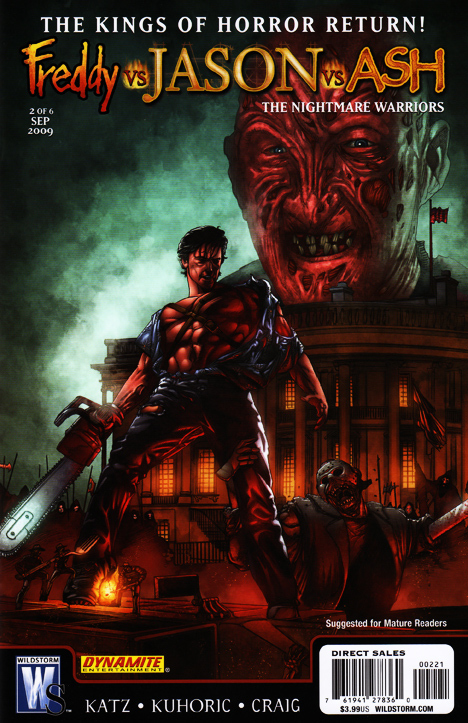 Jason Voorhees leads the dead in the sacking of D.C. that cuts down everyone from shoppers to senators. 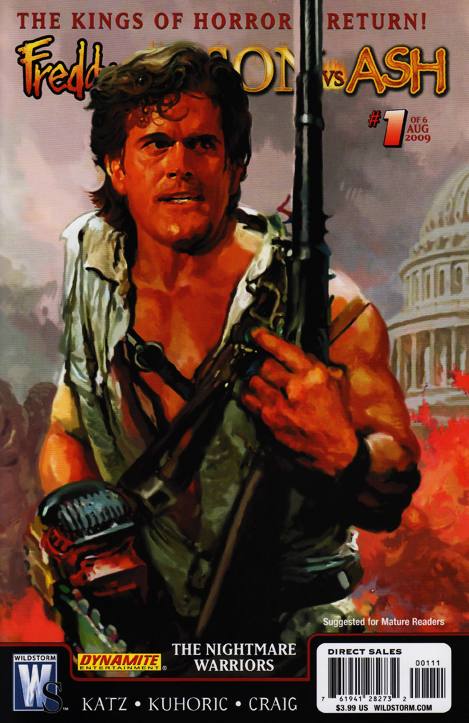 As the bloody end nears, Ash must lead his remaining forces against the amassed titans of terror. Washington has been leveled, and the odds are stacked against the motley crew of survivors. 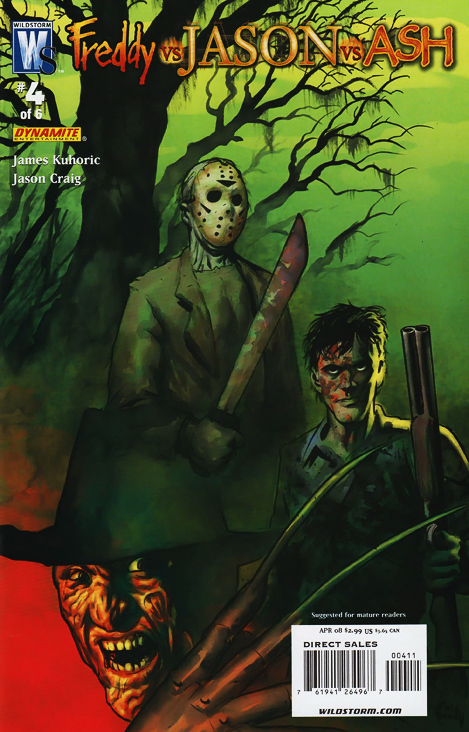 The vicious battles that end this series are legendary—Tommy Jarvis vs. Jason Voorhees, Ash Williams vs. Freddy Krueger, and even the army of the dead against the ghosts of victims past! 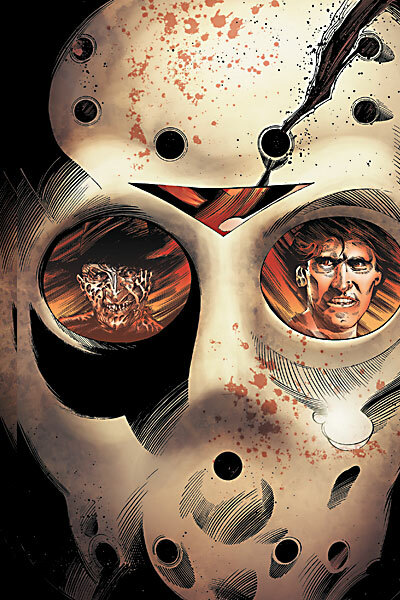 Beneath the bloody waters of Crystal Lake, an immortal evil wakes and begins a new cycle of violence. 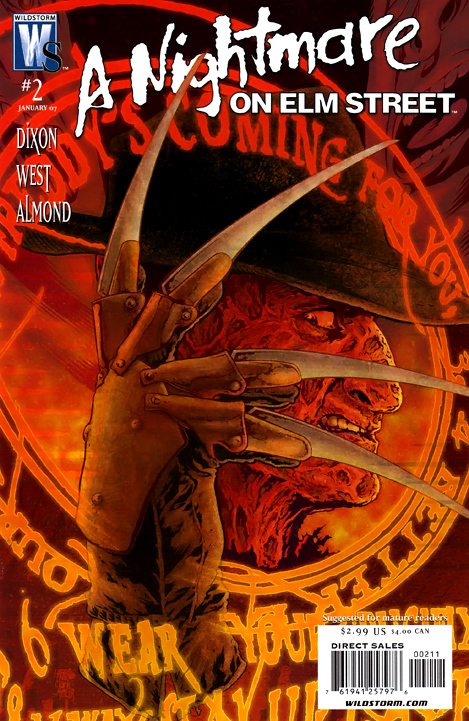 Six months after the events of Freddy vs. Jason vs. Ash, a power-hungry government bureaucrat unleashes the denizens of the Necronomicon, including the banished spirit of the Springwood Slasher, Freddy Krueger. The covert government group called Project Black Book is unleashing creatures of mass destruction in its bid to gain control over the Necronomicon. And as the survivors of Freddy and Jason’s murder sprees congregate, the short-lived reunion is shattered by the violent arrival of Jason Voorhees. 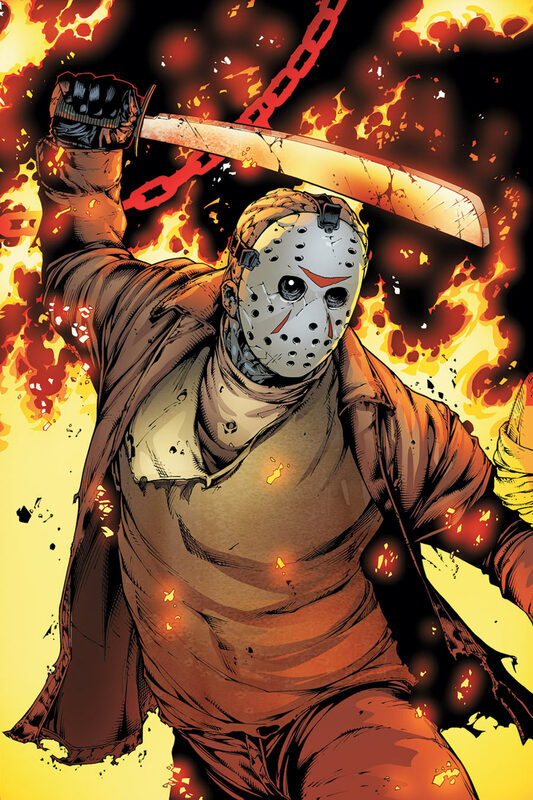 But when a mysterious stranger arrives to aid in the battle, Jason must confront the one man who has not only survived his murderous rampages but has also “killed him” in the past. 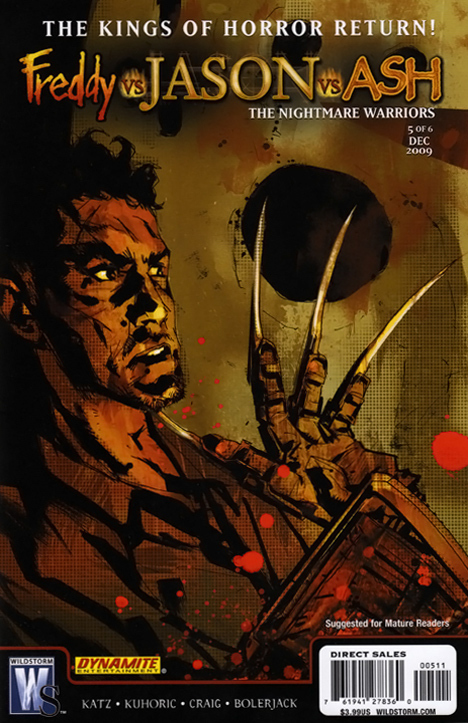 Trade Paperback contains all six issues of the series, along with cover and sketch galleries.